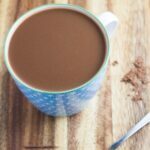 I have been experimenting with different ingredients and have come up with this healthy and delicious Caramel Hot Chocolate. Best of all it is dairy, gluten and nut free, so will be suitable for many people. For those of you who don’t know much about mesquite powder, it is a superfood which is high in protein and a good source of soluble fibre. It has a sweet, nutty caramel flavour and works really well with the cacao powder. You can buy mesquite powder from most health food shops or online. I think that this Caramel Hot Chocolate will go quite nicely with my Anzac slice or Gluten Free Banana & Macadamia Bread. Add all the ingredients to a small saucepan on low to medium heat. Stir to combine and bring to a simmer.